The NordicTrack company became a household name when it brought cross-country skiing indoors. Since then, the company has expanded its home-exercise equipment line to include treadmills, bicycles, stair steppers and more. The Nordictrack C2000 treadmill is no longer being produced but can be bought used. It is a basic, sturdy treadmill for your at-home use. The Nordictrack C2000 treadmill comes with a safety key. The treadmill will not operate unless the key is plugged in to the console. The key is attached to a rope with a clip on the opposite end that you secure to your waistband. If you slip or fall and the key disconnects, the treadmill automatically stops. It also has a heart rate monitor on the console. You hold onto the metal rails with your hands and monitor your workout heart rate. If you want a minute-by-minute monitoring, you can order the optional chest strap for a consistent heart rate check. 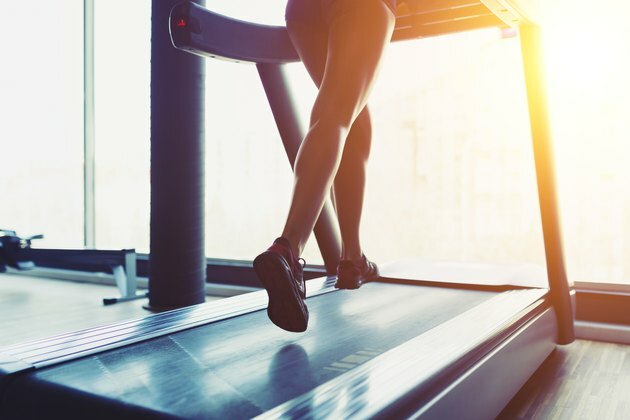 You can select three different options for your treadmill workouts. In manual mode, you adjust the speed and incline at the touch of a button. You can create intervals, steady-state or threshold runs, where you exercise at top speeds. Another workout option is selecting one of the pre-set programs that automatically adjust the speed and incline. The treadmill stores up to three of your favorite manual programs for future use. The C2000 treadmill comes with iFit technology. The iFit system uses pre-set workouts and audio cues provided by a personal trainer. You can listen to your trainer through the speakers on the treadmill,or connect your treadmill to your television, stereo or computer. The iFit workouts also play music to keep you motivated. It is rare to find a treadmill that has a unique feature. Most are simply an indoor, walking or running exercise machine. One interesting feature about the C2000 treadmill is that is has the option to use aromatherapy as you exercise. The treadmill has a place for scent pads -- positioned in front of the fan on the console. When you turn on the fan, the scent carries into the air. Another helpful feature is the built in CD player and speakers.